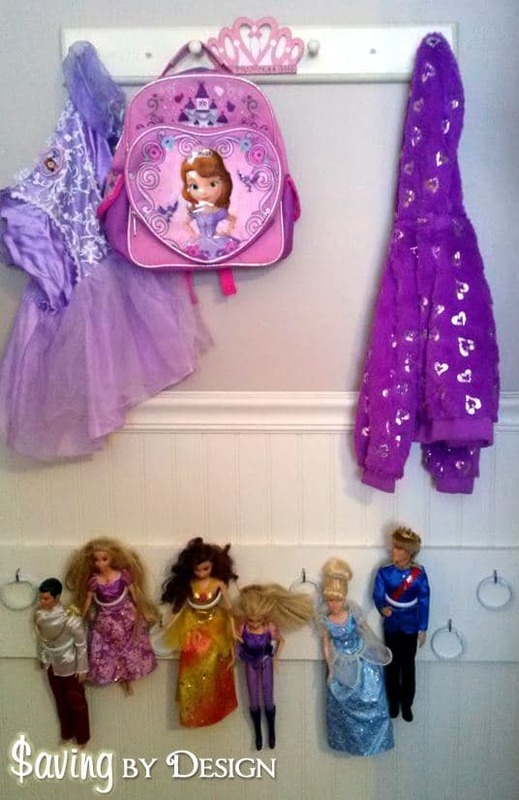 Do you have a little girl with Barbie dolls or maybe Disney princess dolls, as is the case at our house, scattered all over her room? No matter how many times you place them in a pretty basket they end up in the same place…how can she find the one she wants without dumping the entire basket?! Well I found the solution. 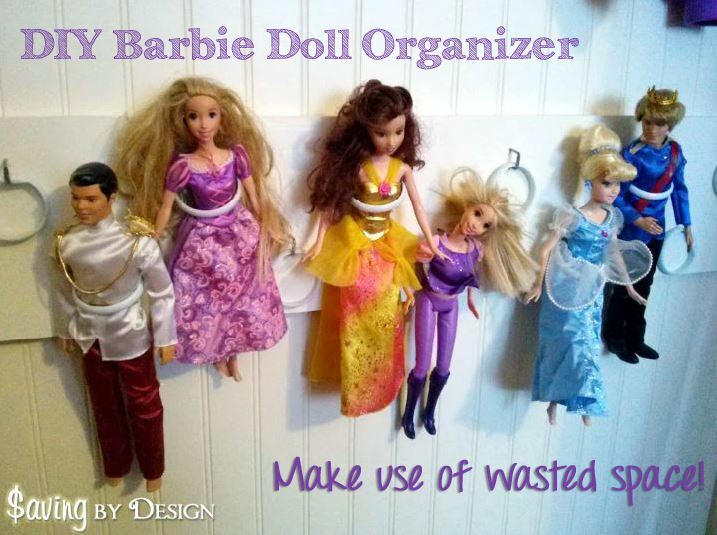 Both you and your daughter will love this easy DIY Barbie doll organizer! 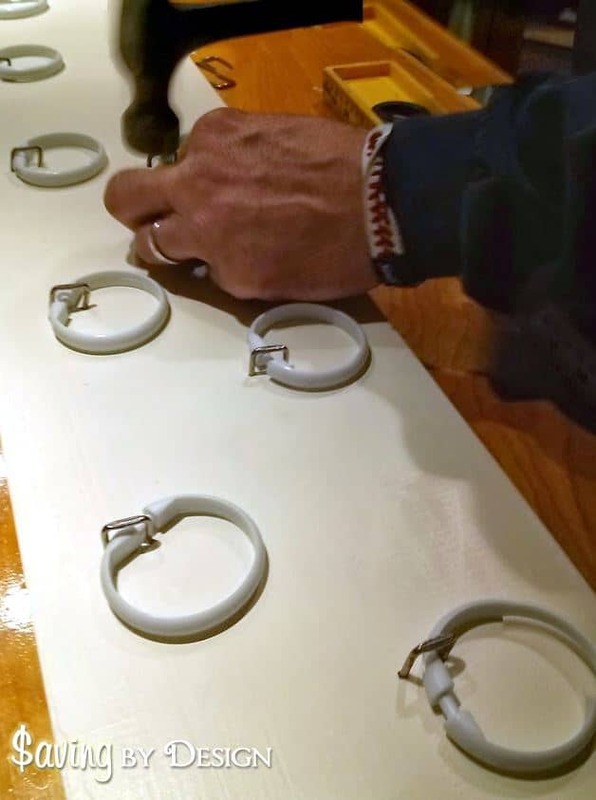 Some time ago I came across a great idea to create a doll organizer using PVC pipe couplings. I loved the idea! When I looked into it though I realized that it would be pretty pricey since the PVC couplings averaged about $1 each. Since my princess has quite a few dolls that could add up quickly. I knew there had to be a less expensive alternative. Instead of PVC couplings we used plastic shower hooks! I found them at Dollar Tree for, you guessed it, $1 for a pack of 12! 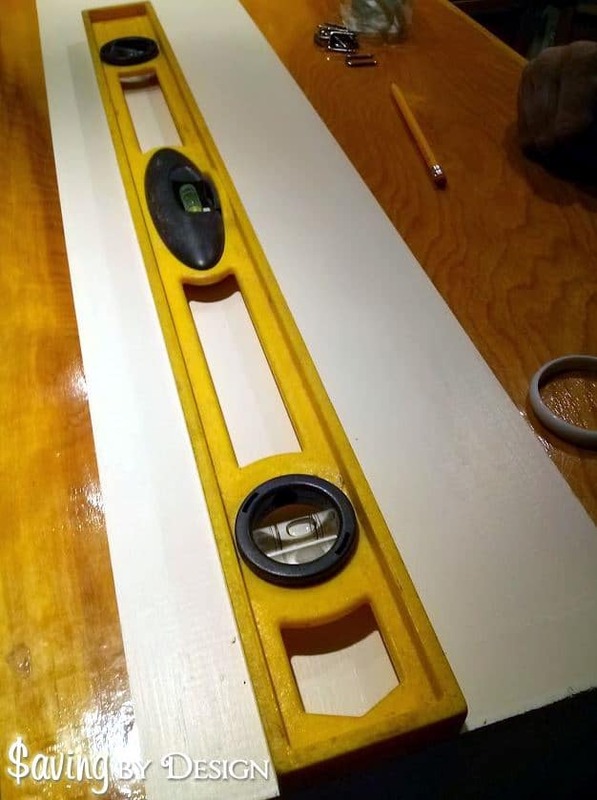 The supplies we used included a 1″ x 8″ board in the length desired, paint, level (or ruler or tape measure), round shower hooks, 1/2″ cable staples, hammer, drywall screws, drill, and pencil. The board we used was scrap wood we had from past projects. If you don’t have any around the house, check the scrap wood at your local hardware or home improvement store. You’ll usually find a steal there and sometimes even find what you are looking for for FREE! 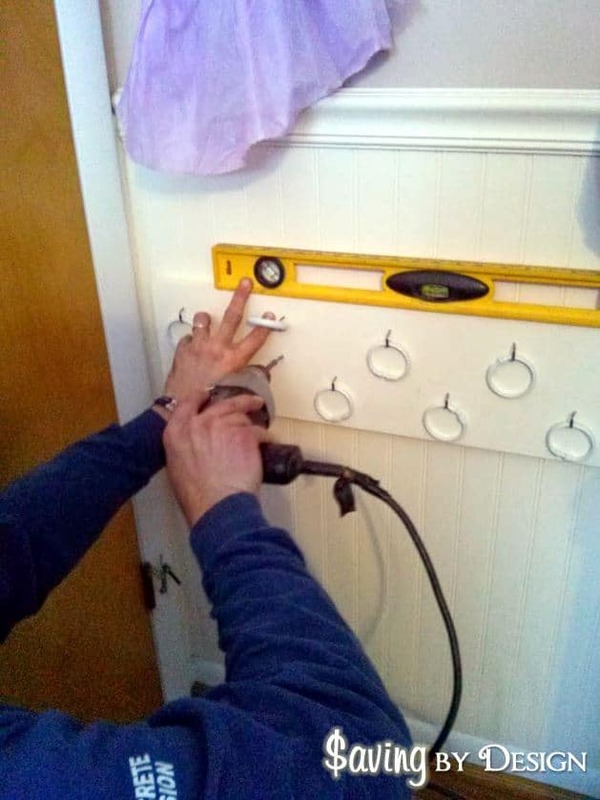 Then we decided on the spacing of the shower hooks and measured it to be consistent across the board. 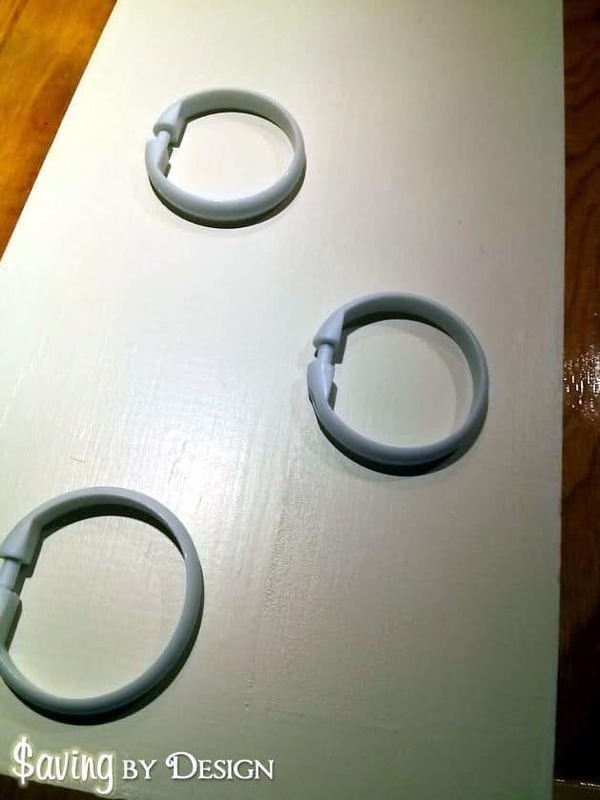 We used a level to be sure our hooks were straight too. We attached our organizer to the wall behind the door in my daughter’s room. What a great way to use that otherwise wasted space! 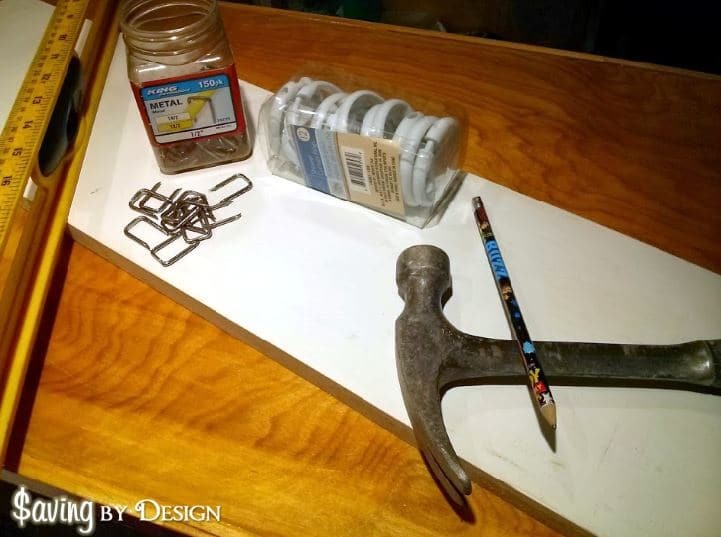 We pre-drilled holes into the organizer so the wood wouldn’t split and then used 1-1/2″ drywall screws to attach it to her wall. If you have any spare screws see if they’ll work or you can use nails to hammer it to the wall also. Always try to use what you have lying around first to save on your spending. And that’s it! 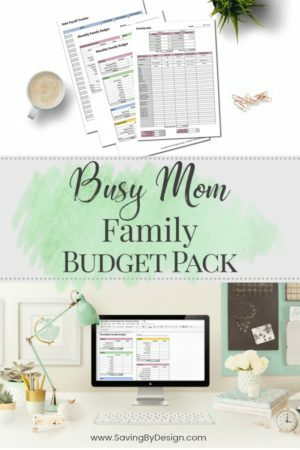 Fill your organizer with dolls and you’re all set! I love that it gets the dolls off of her floor virtually without taking up any space since it’s behind her door. It’s an added bonus that using the shower hooks instead of PVC couplings allows the hooks to lay flat when they aren’t being used. And if dolls ever get stuck, you can simply open the hooks to get them out. 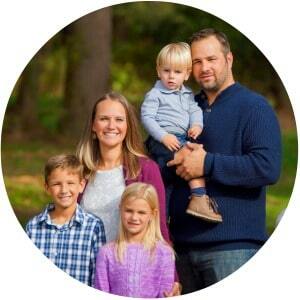 « Three 8-Foot Vinyl Birch Trees with Birds or Butterflies and Name Only $35.99! Our Barbies are stored in a clear plastic over the door shoe rack. Clothes are there as well. Each pouch is labeled with the name of the item (long dresses) as well as a photo example as she is not yet reading. 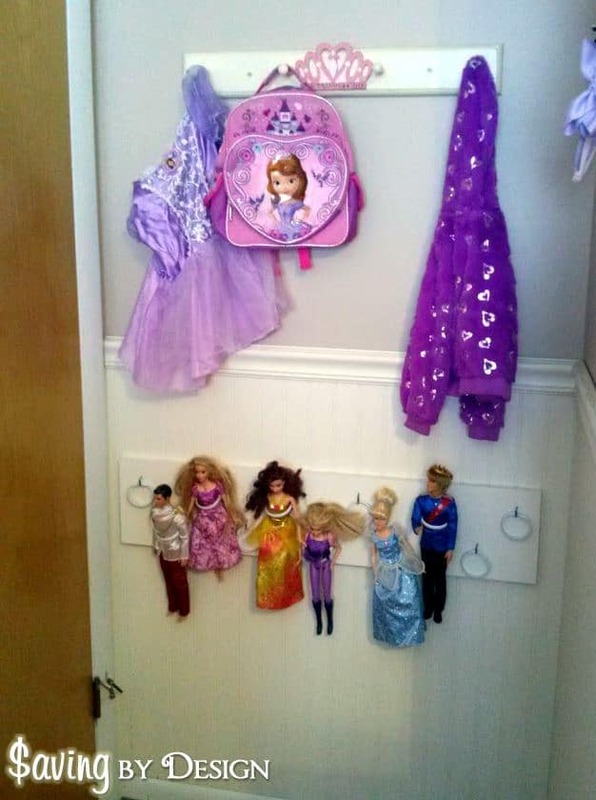 The top rows store the accessories so she can not reach them and therefore can not use them without direct supervision ensuring that these items will not be out and about when younger children come over, to avoid a choking hazard. I’m so happy that you were able to take my idea and run with it! I love that you were able to make it even more affordable. That is always a huge positive for me and it looks like it works great. I just wanted to let you know that we didn’t pay $1 for each coupling, we actually found some pretty cheap ones at our local Home Depot and I think they were something like .39 each. Still not as affordable as yours, for sure, but definitely not as expensive as the ones you referenced. I’m kind of OCD, so I like seeing the uniformity of the line of couplings, but that’s just me! So glad you were inspired to create a more affordable version! -Ester P.S. My husband loved it too! Thanks Ester! I really loved your idea 🙂 And $0.39 is way better than what I was finding! We checked all the local stores and Amazon and kept finding them for around $1 which wouldn’t be bad if she didn’t have SO MANY dolls! lol Thanks again for the inspiration! 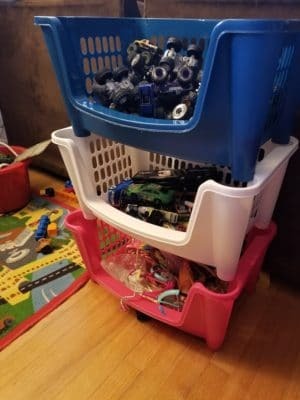 To be honest, I just found stackable baskets at Home Depot last week that I’ve been using for cars, monster trucks, and random Barbie dolls and accessories.